Rogue detection is enabled by default on a Wireless LAN Controller & you can view detected Rogue APs in “Monitor > Rogue > Unclassified APs” section. Here is screen capture of that in one of my controller. Let’s create a Rogue Rule to classify certain APs which advertize known SSIDs (belong to another organization in your premises) as Friendly External. You can do this via GUI in “Security > Wireless Protection Policies > Rogue Rules” section. You have to give a Rule Name & Rule Type as “Friendly” with State as ” External”. Once you create the rule, you can add conditions. In this example we will use SSID as condition & use “match any” as match operation. If you configure as “match all”, all conditions to be met in order to classify as Friendly External. 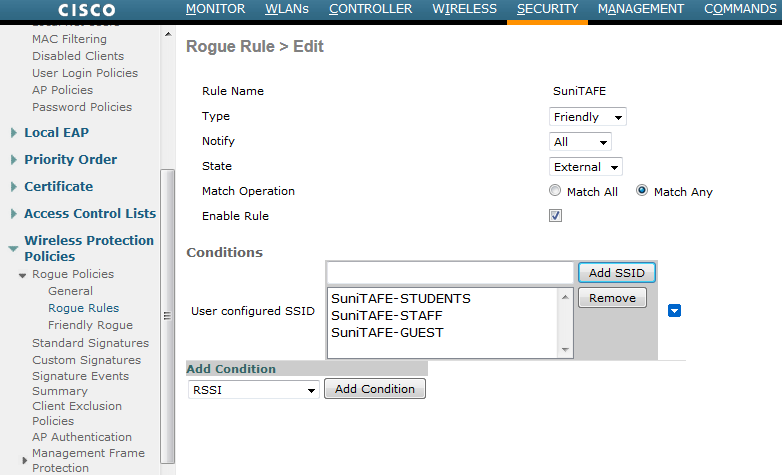 In this example we will configure “SuniTAFE-STUDENTS”, “SuniTAFE-STAFF”, “SuniTAFE-Guest” avertising SSID as Friendly External. Here are complete list of conditions which can be used for Rogue Classification. 1. SSID—Requires that the rogue access point have a specific user-configured SSID. If you choose this option, enter the SSID in the User Configured SSID text box, and click Add SSID. 2. RSSI—Requires that the rogue access point have a minimum received signal strength indication (RSSI) value. For example, if the rogue access point has an RSSI that is greater than the configured value, then the access point could be classified as malicious. If you choose this option, enter the minimum RSSI value in the Minimum RSSI text box. The valid range is -95 to -50 dBm (inclusive), and the default value is 0 dBm. 3. Duration—Requires that the rogue access point be detected for a minimum period of time. If you choose this option, enter a value for the minimum detection period in the Time Duration text box. The valid range is 0 to 3600 seconds (inclusive), and the default value is 0 seconds. 4. Client Count—Requires that a minimum number of clients be associated to the rogue access point. For example, if the number of clients associated to the rogue access point is greater than or equal to the configured value, then the access point could be classified as malicious. If you choose this option, enter the minimum number of clients to be associated to the rogue access point in the Minimum Number of Rogue Clients text box. The valid range is 1 to 10 (inclusive), and the default value is 0. 5. No Encryption—Requires that the rogue access point’s advertised WLAN does not have encryption enabled. If a rogue access point has encryption disabled, it is likely that more clients will try to associate to it. No further configuration is required for this option. 6. Managed SSID—Requires that the rogue access point’s managed SSID (the SSID configured for the WLAN) be known to the controller. No further configuration is required for this option. Note The SSID and Managed SSID conditions cannot be used with the Match All operation because these two SSID lists are mutually exclusive. If you define a rule with Match All and have these two conditions configured, the rogue access points are never classified as friendly or malicious because one of the conditions can never be met. Now if you check “Monitor > Rogues > Friendly APs” you would see all APs advertising these SSID classified as “Friendly External” as per your Rogue Rule. 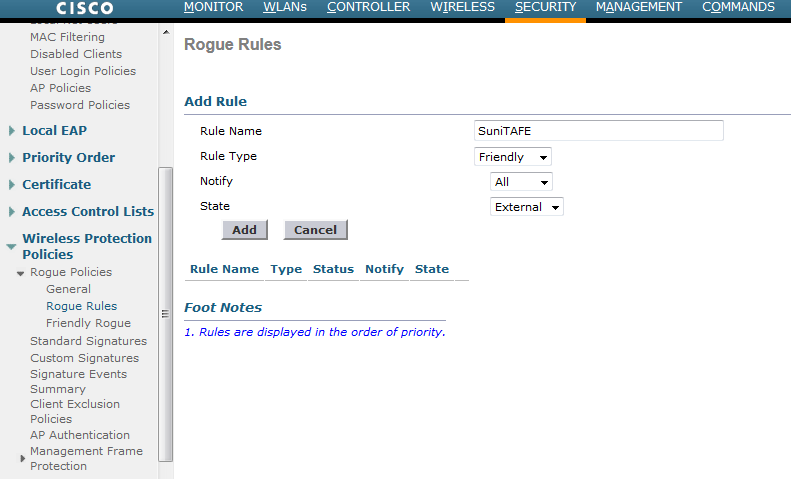 You can configure up to 64 rogue classification rules per controller using the controller GUI or CLI. If you look at controller configuration you will see the following CLI commands related to the rogue classification. In the above shown Rogue classification in one of my production WLC which is on WLC 7.4.100.6 software code. We will see how to configure this on WLC 7.0.116.0 which is the version in the CCIEW v2.0 lab exam. Here how you can create a Rogue Rule under Security Section. Now if you go to “Monitor > Rogue > Friendly AP” you would see something like this. You can configure this feature via CLI as well. Here is the steps to do that via CLI. adhoc          Configures adhoc rogue (IBSS). ap             Configures rogue access points. auto-contain   Configures rogue auto-containment parameters. rule           Configures rogue classification rules. (WLC2) >config rogue rule ? add            Adds a rule with Match Any criteria. Maximum of 64 rules are allowed. match          Configures matching criteria for a rule. (WLC2) >config rogue rule add ? ap             Configures rules for APs. 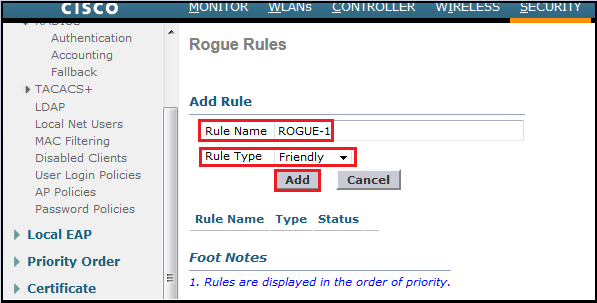 (WLC2) >config rogue rule add ap ? priority       Configures priority for a rule. (WLC2) >config rogue rule add ap priority 1 ? (WLC2) >config rogue rule add ap priority 1 classify friendly ? <rule-name>    Rogue classification rule name. Rule 'ROGUE-1' created successfully. Use 'config rogue rule enable ROGUE-1' to activate the rule. Rule is already set to this match operation. (WLC2) >config rogue rule condition ? ap             Configures condition for the APs. (WLC2) >config rogue rule condition ap ? set            Configures a condition for the rule. delete         Deletes a condition from the rule. (WLC2) >config rogue rule condition ap set ? client-count   Requires a minimum number of clients to be associated with the rogue AP. duration       Requires that the rogue has been detected for a minimum period of time. managed-ssid   Requires the SSID to be known to the controller. no-encryption  Requires that the advertised WLAN does not have encryption enabled. rssi           Requires a minimum RSSI value. ssid           Requires a specific SSID. 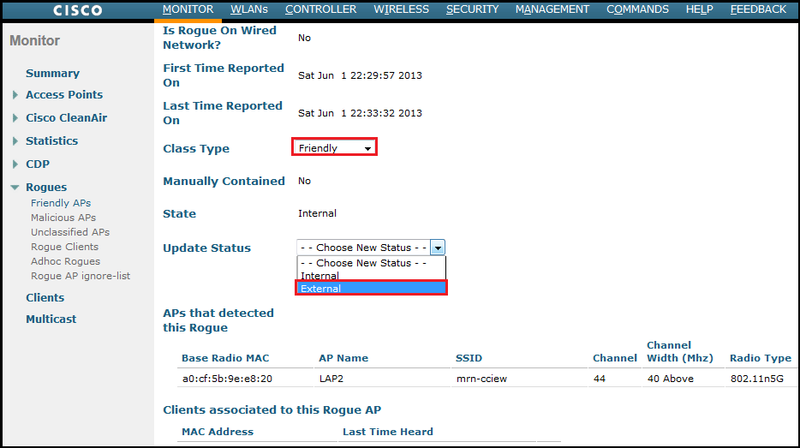 (WLC2) >config rogue rule condition ap set ssid ? 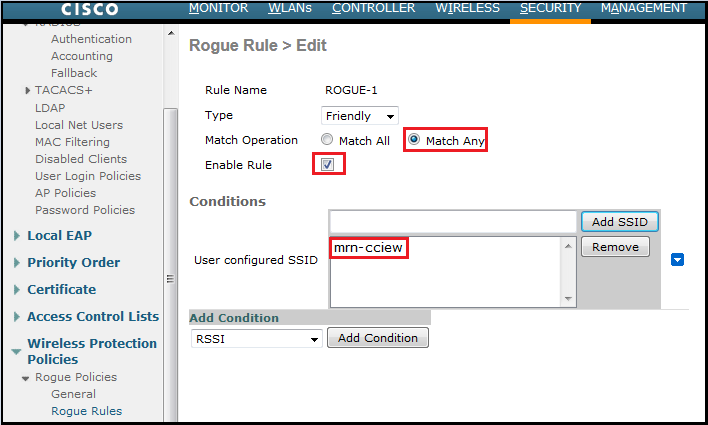 (WLC2) >config rogue rule condition ap set ssid mrn-cciew ? You can verify using following CLI commands. You can change a Rogue AP’s state as below. (WLC2) >config rogue ap classify ? friendly       Configures rogue access point classification to friendly. malicious      Configures rogue access point classification to malicious. unclassified   Configures rogue access point classification to unclassified. (WLC2) >config rogue ap classify friendly ? state          Configures rogue access points rogue state. (WLC2) >config rogue ap classify friendly state ? external       Acknowledge presence of an access point. internal       Trust a foreign access point. (WLC2) >config rogue ap classify friendly state internal ? <MAC addr>     Enter the MAC address of the rogue AP (e.g. 01:01:01:01:01:01). Now let’s say you have few other SSIDs to add to list as “Friendly AP” so you can do it like this. In my example I would configure “LTUWireless2” & “eduroam” SSID advertising AP as friendly as well. Now we will add another condition only these SSID beacon hear above -90dBm only we will classify as Friendly Rogue. In this case you have to have 3 rules each with match condition all (both SSID & RSSI). Will delele the existing condition & write the new 3 rules as below. I have been using WCS Controller.Template.Rogue AP rules. WCS might be faster way of pushing rules to multiple WLC’s. Not sure if exam cares since it ends up in WLC anyway. Yes, that’s true as long as configs are push to controllers & WCS/ WLCs are in sync. What does Notify means. What does Golobal and locan spefies under Notify dropdown. Hello, I’m very interested in see how we can manage Friendly External SSID’s when they are not the same. As far as I now till the the version 7.6.120 this is impossible to manage automatically. i need to learn about how rogue detection occurs . Packet level view of the same . Where could i find it? Hi Rasika, it’s working now, but I’m not using Wildcards.. Using “User configured substring-ssid” works very well. In my case I’ve just used the sub string “ZON” and all the ZON’s were automatically classified correctly. Do you have any working examples of detecting a rogue access point that is connected to you network? I’m tasked with configuring a 5520 WLC running 8.2.110 to actually alert me when there is a rogue ap connected to our network. I have a 1242AG in autonomous mode advertising one of my SSID’s connected to a trunk port on the switch. In the same switch I have configured an AP in rogue detection mode. I just want to know, How rogue AP is detected by SSIS or AP.? Can you please elaborate this feature i have find out so much in google and nothing i get in beneficial.